In a clever and creative twist this month, Copperhead #9 tells the events of issue #8 from a totally different perspective. Boo has been kidnapped and traveling across the desert headed for a nefarious town of scum and villiany. Unknown during the previous issue was that Sheriff Bronson had formed a posse to track down the band of kidnappers.This interesting bunch of "deputies" were hot on the trail and now we know exactly went down from their point of view. Joined by Ishmael, Cletus and Hickory's two 'Arties,'Bronson is racing across the sun-drenched desert in hot pursuit of Boo's captors. This ragtag group of trackers figure that they're headed to The Bastion, a safe-haven for criminals. Now if only they can get along long enough to rescue Boo. Jay Faerber has developed some distinct characters even the Arties have a philosophy that contrasts with Ishmael's more loner leanings. Bronson as expected took Ishmael to task for what she considered as spying on her despite helping during the attack at Luken's house. Cletus proves himself to be useful after Bronson questioned his value. It's a lot of turmoil for a posse to deal with but under Faerber's direction these conflicts seem natural and expected considering the personalities.Throughout it all Bronson remains in charge and as always shows leadership and tenacity. Bronson is one of comic's best alpha females. Copperhead is consistently one the best looking books thanks to Scott Godlewski and Ron Riley. Godlewski's thin sharp lines provide precise detail and incredible character designs. The layouts in this issue especially add to the western motif as the posse gallops across wide empty landscapes of sand and occasional hills. Godlewski is a master of squeezing out the maximum amount of energy of a scene by moving the camera's perspective to deliver a great punch at the height of the action. The stampede sequence is an example of that. Paired with Riley's colors the pages take on a more textured look from boulders to the dried and cracked surface of the desert. Issue 9 might be his best work yet. And the colors are so varied and bright but never overpowering. This is one of those fortuitous collaborations between artists that bring out the best in each other and are totally in sync. It shows on every page. 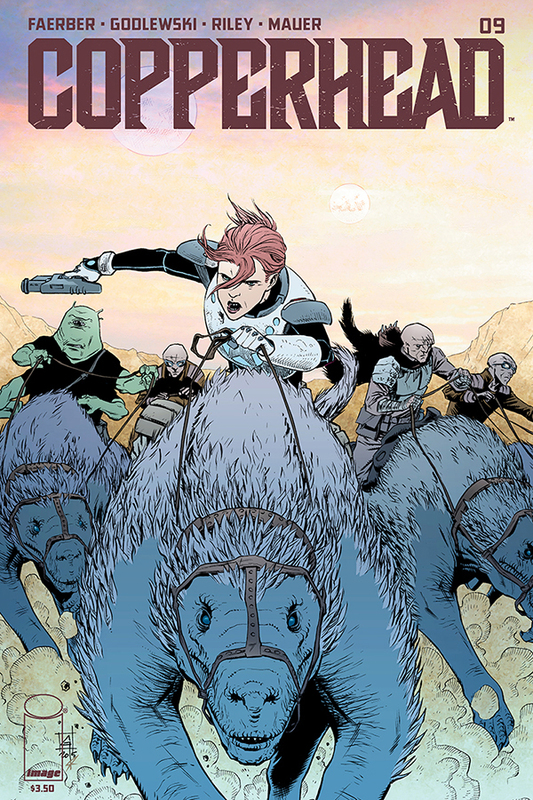 Copperhead #9 is the perfect set-up going into an extremely dangerous rescue mission. If this issue showed us anything, it's that no one is completely safe.The pacing is fluid yet fast and exciting. The dialogue is measured but concise. It's simply one of the best comics produced because of near flawless execution.